Hood insulation blankets serve many purposes on the 3rd generation Trans Am & Firebird models. They keep the engine heat away from the hood which can prevent premature wear on the hood paint and also decals. A hood insulation blanket can also eliminate excessive exterior engine noise both in the cabin of the car and also from outside the car. 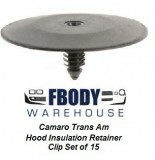 Fbodywarehouse offers a complete line of replacement hood insulation blankets for your 1982 - 1992 Firebird and Trans Am..Our blankets also include the proper mounting clips with every set!